The name John Hughes is synonymous with the ‘80s and specifically teen angst movies. I cannot even really pinpoint the time I first heard about him, but John Hughes became a hero, role model, inspiration, and influence on me and my writing. There had not been a lot of movies about teenagers for teenagers. I’m not really sure if there were any. There are a lot of unique themes they explore: coming of age (as cliché a phrase as that has become); fitting in; peer pressure; self esteem; puberty and the changes it brings; and love. A lot of this ground was covered by various TV shows, but none stick out for me that spoke to me as a teenager. Spanning a five-year period, they explored what it meant to be a teenager, and how brutal it could be one minute then amazing the next. How truly mean teenagers can be on one hand, and how caring and compassionate on the other. More than anything else, for teens who felt isolated, or like they were the only ones feeling the emotions they were, these movies made them realize they were not alone. They offered hope in a sometimes completely hopeless time of life. This may have been the last movie I saw in a drive-in theatre. Mathew, my good friend and neighbour, invited me to see this with him. It was part of a double feature at the Green Acres Drive-in in Lethbridge with The Goonies. The Goonies was the first movie, I remember, because it was virtually impossible to watch at dusk because of all those underground scenes. 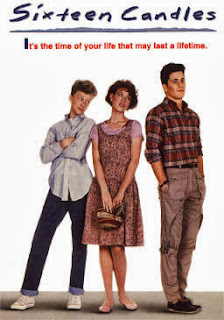 Sixteen Candles followed, and it had a profound effect on my 14-year-old personality. The story focuses on the character played by Molly Ringwald. Her sister is getting married and, in all the hustle and bustle, everyone forgets her birthday – her 16th birthday. She has a crush on a boy, who she thinks does not even know she exists, and the plot goes on from there. What struck me was not so much the main plot, but something that happened late in the movie. Anthony Michael Hall plays this spassy nerd throughout the movies. At the end, he finds himself in a car with the drop-dead gorgeous captain of the cheerleaders, who is passed out. Like the goof he is, he gets photos taken with her by his friends (in the days before cell-phone cameras). Then a funny thing happens. She awakens, and they share kind of a tender moment, and even kiss. Even if tenderness may not have been John Hughes' intent, it was the effect it had on me. I always thought maybe the nerdy guy (a.k.a. me) could get the girl in the end. The Breakfast Club is set in detention, or Saturday school, one day. A jock, skid, prep, nerd, and outcast spend the day together, first resenting each other then eventually bonding. I never did see this in the theatre, although I absolutely loved the anthem from the movie "Don’t You (Forget About Me)" by Simple Minds. Instead, I saw this in a much stranger and more amazing environment. I had a crush on this one girl for almost two years, right through Grade 11 and 12. Finally, part way through Grade 12, we became close, and I used to visit her regularly. One Friday night, my best friend Chris Vining, and buddies Randy and Dave, all went over to her place. Randy had made a copy of The Breakfast Club and we watched it in her basement. It was an absolute dream come true, because at that point she was the girl of my dreams. Molly Ringwald is back in her third John Hughes’ movie. This time she plays a high school senior who is not too popular. As she readies for her grad prom, enduring bullying and derision, she catches the eye of a popular boy, while oblivious to the affection of her best friend right in front of her. This was the last John Hughes movie I saw in the theatre. I was working at Gergeley’s Greenhouse and it was around my 17th birthday in February. I went to get something from my car (well my mom’s car), and there was a note on the windshield. 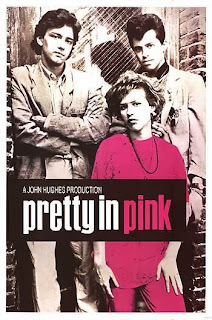 It was from my friend David who invited me out for food and a movie, Pretty in Pink in particular, for my birthday. 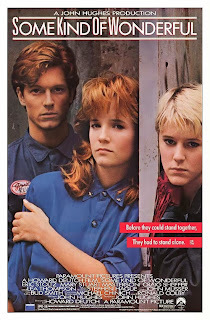 This time around Eric Stoltz plays a boy who is not too popular in school. He has a crush on his dream girl, who then breaks up with her boyfriend. He asks her out, only to be set up for a fall by the ex-boyfriend. Meanwhile, he too can't see the affection for his best friend right in front of him. Some Kind of Wonderful is a role reversal of Pretty in Pink in many ways. Considering how deeply John Hughes moved me on the first three occasions, Some Kind of Wonderful came out at the wrong time. It was just as I was leaving home to go to university, and I had no way of getting to a theatre to see it. I recall hearing commercials on the radio for it, but never got to it. It was the summer of 1995, my last at the University of Alberta, where I decided to have my own John Hughes film festival. The video store did not have Pretty in Pink, but it had Sixteen Candles, The Breakfast Club, and Some Kind of Wonderful. I watched them in order, thus delaying again seeing the fourth in John Hughes teen angst tetralogy. It was well worth the wait. People have said Ferris Bueller’s Day Off is among these, but I never connected with it. Really, it never resonated with me, and I never really identified with Ferris. Quite the contrary actually. He was the cool kid, the guy with the good-looking girlfriend who could seemingly get away with anything. Instead, I identified with his best friend Cameron, despite the Detroit Red Wings jersey. (To be honest, back in the ‘80s, I thought it cool that any character in any Hollywood movie would be wearing a hockey jersey of any kind). 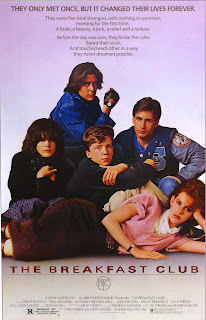 My discovery of John Hughes coincided with my desire to write my own stuff about teenagers. Seeing his movies made me realize that I was not alone, but also there was a market for that kind of story. The difference was that I wanted to make music a major part of that. The result was a play I wrote that, on first cut, was not very good. It was a semi-autobiographical look at my Grade 11 year in high school. Yet there are enough bones in there, I believe, to make something good out of that. And that, in essence, is the power of John Hughes. He was not just a filmmaker and storyteller. Beyond entertaining, he inspired me to tell my own story. He was a role model in how to do that, and his influence is all over that play. For all that, I am eternally grateful to John Hughes. Rest in peace.